Every weekend we dig into the archives. This post by Peter was originally published in July 2014. Several weeks ago I attended the annual New Zealand Association of Economists conference in Auckland. Geoff Cooper, Auckland Council’s Chief Economist, had organised several sessions on urban issues, and as a result there was a lot of excellent discussion of urban issues and Auckland’s housing market. You can see the full conference programme and some papers here. At the conference, I presented some new research on housing and transport costs in New Zealand’s main urban areas. My working paper, enticingly entitled Location Affordability in New Zealand Cities: An Intra-Urban and Comparative Perspective, can be read in full here (pdf). Before I discuss the results, I’d like to thank my employer, MRCagney, for giving me the time and the data to write the paper, along with several of my colleagues for help with the analysis, and Geoff Cooper for suggesting the topic and providing helpful feedback along the way. The aim of the paper was to provide broader and more meaningful estimates of location affordability that take into account all costs faced by households. In my view, widely-reported sources such as Massey University’s Home Affordability Report have too narrow a focus, looking only at house prices. However, a range of research has found that transport costs vary between different locations depending upon a range of factors such as urban form, availability of transport, and accessibility to jobs and services. And transport costs are pretty large for many households! I used two methods to provide a more comprehensive estimate of location affordability in Auckland, Wellington, and Canterbury. First, I used Census 2013 data to estimate household housing, car ownership, and commute spending at a detailed area level within each of the three regions. This allowed me to estimate variations in affordability between areas within individual regions. Second, I used household budget survey data to get a sense of how New Zealand cities stack up against other New World cities. First, rents (a proxy measure for housing costs) tended to fall with distance from the city centre. However, commute costs tended to rise with distance – meaning that outlying areas were less affordable for residents once all costs are included. This was consistent with previous work on location affordability in New Zealand and the United States. Second, international comparisons suggest that Auckland and Wellington have relatively high housing costs and that this may be driving some of the affordability findings. While this finding lines up with previous research that’s focused on house prices alone, it’s important to note that the location affordability estimates suggest that a focus on greenfields growth alone may not save households money. Third, while I didn’t identify any specific policy recommendations, I’d recommend that (a) policymakers should consider all location-related costs when attempting to address affordability for households and that (b) further research should focus on removing barriers to increasing the supply of dwellings in relatively accessible areas. These maps show two measures of location affordability within Auckland. The left-hand map shows estimated housing costs (i.e. rents) as a share of median household incomes at a detailed area level. Broadly speaking, this map shows that expected housing costs fall between 20% and 30% of household income in most of the city, although some areas are relatively less affordable. The right-hand map, on the other hand, incorporates expected car ownership and commute costs. Overall location affordability is lower throughout the city. Expected housing and transport costs rise to 40-50% in areas of west and south Auckland, as well as the entire Whangaparoa Peninsula. 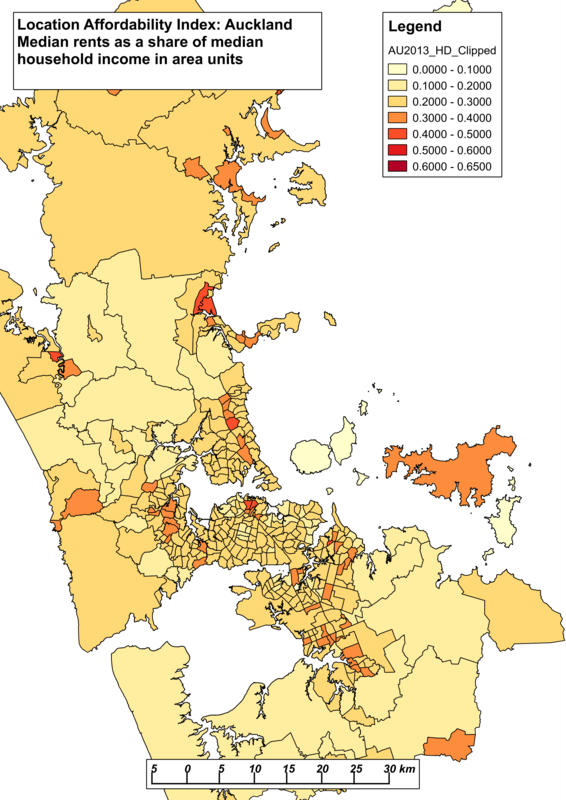 The most affordable areas for their residents tend to be in Auckland’s inner isthmus suburbs. I’ve also combined this data into a graph that presents location affordability by distance from Auckland’s city centre. The bottom (blue) line shows housing costs as a share of median household income, weighted across all area units within each 2-kilometre concentric circle radiating outwards from the city centre. It shows that, on average, households spend a similar share of their overall income on housing costs in both close-in and outlying suburbs. The top (red) line shows that combined housing, car ownership, and commute costs increase as a share of household incomes with increasing distance from the city centre. 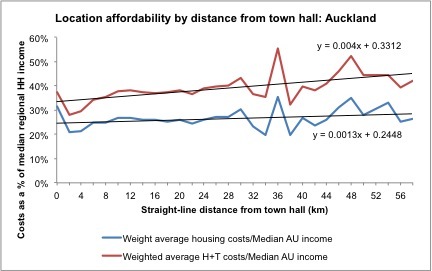 On average, households that live further out of Auckland spend more on location-related costs, as lower lower rents are offset by added commute costs. The results for Wellington and Christchurch were broadly similar – although with a few interesting differences related to their urban form and transport choices. However, as this is the Auckland Transport Blog, I’m going to suggest that you read the paper to see those results. It’s long, but it also presents a lot of new data on housing and transport costs in New Zealand.